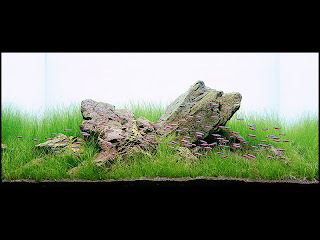 Iwagumi aquascapes are a subset of the Nature Aquarium style, pioneered by Takashi Amano. Based of Japanese gardening principles, iwagumi literally means "rock formation." Rocks form the structure of Japanese gardens, and so in an iwagumi aquascape, rocks play a major role. Also, how these rocks are placed and how many of them there are is also very important. 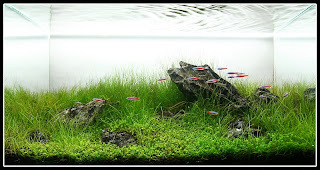 Many different styles of iwagumi have been adapted to the aquarium, but the overall theme is that of tranquility and simplicity. 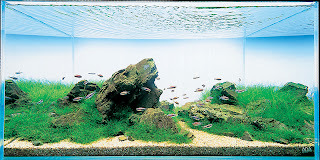 The most common iwagumi style is called sanzon iwagumi. Sanzon means "three pillar" in Japanese and these aquascapes make use of three rocks, with two smaller rocks and one larger rock. According to JAANUS, this term was first used in the 11th century Japanese garden treatise "Sakuteiki." The grouping of stones comes from Buddhism; the central stone is called the chuusonskei (or the big Buddha) and the smaller flanking stones are called kyoujiseki (or attendant stones). The kyoujiseki are often tilted or pointed towards the chuusonskei as if bowing down to it. The chuusonskei is almost always positioned according to the Golden Rule. Other styles are less frequent, but always make use of an odd number of stones of varying sizes. In the aquascaping community, iwagumi has taken on additional traits as well. 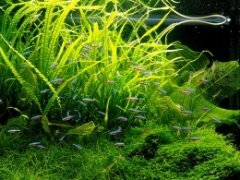 Iwagumi aquascaped aquariums often have one single type of carpeting plant (often glosso, hair grass, or hemianthus callitrichoides) and one single species of schooling fish (most commonly rummynose tetras, cardinal tetras, or harlequin rasboras). This adds to the feeling of simplicity in the aquascape. Many assume that caring for and maintaining an iwagumi aquascaped aquarium is easier than other styles. It is in fact much harder due to the restrictions in terms of a single plant species and the high light levels. Carpeting plants are often rather slow growers and don't absorb much in the way of nutrients. Therefore, starting an iwagumi aquascaped aquarium and getting it balanced is by far one of the most challenging aspects of the hobby. Algal blooms are common and stem plants are not available to help cycle the tank and achieve a balance. Instead, it is a lot of trial and error trying to get rid of algae and determine the correct fertlizer levels. Most use Amano shrimp or other types of shrimp to help control aglae. Iwagumi aquascaped aquariums are definitely not for beginners, but can be some of the most beautiful and peaceful aquascapes imaginable. Very cool. I'm putting you on my blogroll. These are fantastic tips, and good examples. I like all of the tanks shown, but the third one really "rocks". I know, corny, but seriously, I'd love to get another tank now and imitate that one. The second one is growing on me as well, but there is something almost gravitational about #3. What a lovely blog...and an amazing post!! Great tips!!Cheers!! Hey! I have been reading your blog for a while. I used to have a blog similar to yours 3 years ago, known as AQUOI. Back then I had a 60cm Iwagumi tank with a thick Glossostigma carpet. It took me 1 long battle with Black Brush Algae to get it right. Glossotsigma is a hungry plant. Once it is established, it's growth and nutrient intake is pretty high. As long as it healthy, Algae will not grow. perfect sense of proportion and balance. beautiful. awakens something innate. Wow, I have never heard of this kind of aquarium before. It is so beautiful. Are there any books or other websites that I can go to where I can learn how to effectively set up an Iwagumi style tank? Thank you.